Слайды / The Slides - Soma - BFW Recordings netlabel - Music is free! ambient, shoegaze, indie, experimental, electronica - independent netlabel sharing music with you for free! A mammoth debut album from Russian indie rockers The Slides. 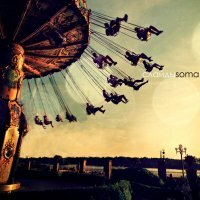 Soma is an album indie guitar rock, clearly influenced by britpop and sounding like something between M83 and Oasis. Valued as the nectar of the gods, Soma was a ritual drink of importance among the Indo-Iranians, possessing great strength and giving an overwhelming sense of tranquility to those who’d taste it. It was not randomly chosen as the album’s name as the band’s LP is as pleasantly intoxicating, especially, when being listened to full-volume. The Slides make music that is meant to be played loud, so that’s no surprise. The tracks might appear similar to one another, but they are meant to be puzzle pieces, perfectly fitting each other, painting a larger picture of the meaning behind each song. From the first track – ‘You to me, me to you’, to the last – ‘Sophites‘, this album holds tension and intensity in a pleasurable way. The lyrics to the title track – ‘Soma’ deserve special attention. The vocalist is loud and clear, almost pleading with you in some parts, ready to break down, whispering in others, as though speaking directly to you. To be fair, The Slides don’t want to be experimental and they’re not, but that’s because they keep to what they’re best at – the pure untouched spirit and soul of rock’n’roll that lives in them and this album. Put it on, turn it up and enjoy!